I have heard/seen people date for too long and end up not getting married. Well, amend the broken heart and move on, it’s not like there was a written agreement before you both moved from first to second term in one relationship. My major concern goes to the ones that didn’t get married because of genotype issues. It breaks my heart. For those who still don’t understand what I mean by genotype, I will explain. According to wiki my good friend, Genotype is the genetic makeup of a cell, an organism, or an individual usually with reference to a specific characteristic under consideration. I will spare us the plenty biological term, explanations and diagrams, but if you want to know more, google is your friend. The genotypes in humans are AA, AS, AC, SS. Yes, I heard of AC sometime back too, and I foolishly argued with the lady until I used google. Basically, AC is not common but they say AC and AS are both abnormal. 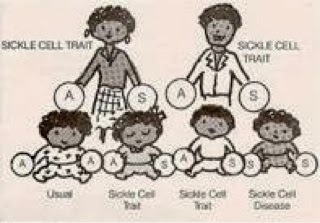 Sickle cell disease (a recessive disorder) is a very serious medical condition. Someone with the genotype AA can marry across (AS, AC, SS). There’s no risk of the couple having a sicklier for a child. Someone with the genotype AS should marry someone with the AA genotype only! Same goes for someone with AC and SS. There are cases where two abnormal was combined that is an AS and AS or AC and AC or AC and AS couples and had up to five or six children without a single sicklier among them. But why risk it? What if you’re not so lucky? Can you forgive yourself when you end up having a child with the sickle cell disease and put the child through the agony the disease brings when you could have easily avoided it? Please don’t try the luck we are not even sure you have. I guess that explains how it works to you, so please no matter your age, try find out his/her genotype before starting any form of relationship. Except you clearly know nothing more than hug will ever transpire between you both. How can I find out my friend/intended gf/bf genotype without seeming desperate for marriage? 1) Find out your own genotype first. Let’s know what we are dealing with. If yours is AA, then don’t sweat. Once the answer isn’t favorable, keep it at friendship and don’t try your luck. Don’t tempt the devil to tempt you and don’t force a miracle. Kill the feeling and up your search, no time! For those that are lucky enough to have AA genotype like me, please don’t be cocky about it. No one chose his or her own. Our parents melted it down to us. Be nice and understanding. Be cautious to hand down good blood to your unborn child. Don’t hand them pain and misery in form of blood. It’s not an easy experience. AS and AS should not marry. And definitely SS and SS must not marry since there’s absolutely no chance of escaping having a child with the sickle cell disease. AA and AA? Carry go. AA and any other genotype? Cool. Make wise decisions every minute. The future starts now. Pls can u talk more about AC and AS….any possibility of them getting married? Loool read it through again. \nTaking your time to know more about your friend instead of rushing feelings like fried plantain is the special way. Thank you for this, but I will like to learn more about this option. Can I reach you for a more elaborate discussion? Hello uncle UK practicing doctor….or in our words…My chief. Let’s go with what is generally obtainable in the country at present first na…haba minimum wage earners can’t afford it and have you sat in a Nigerian peads clinic and experienced the trauma to families who were unaware of the ramifications or better yet blissfully in “the spirit” and end up in a world of pain. Plus remember the country is still largely under the influence of religion and of the 2 main denominations either doesn’t consent to aborting a fetus just becos it has a genotype you don’t want..or genetically modifying a human that’s still a testy topic. Till your regular PA…lemme not go to cleaner yet…can afford the tech…Pls it’s not a 1 in 4 possibility of getting an SS child but each child born to parents that have an S gene has a 1 in 4 chance of being SS…people have woken up to 4 kids all SS…Pls pls I have seen the love that was proclaimed die when all time and money go into fighting to keep the kids alive that nothing gets invested in the love from before. yes i know but it costa alot and we all know complications can also arise from terminating a pregnancy at 12-14 weeks.so why risk it when it can be avoided. also nothing is assured and will you keep undergoing the procedure anytime you pregnant? well i dunno sha but the stress no make sense abeg. when AC and AS get married d sickle cell of their child ll b ad normal…thank God dat my blood group is O rhesus positive and my genotype is AA …in case dere is any pretty lady here pls I am at ur service. How about a case whereby the girl says the guy must be AA as she is AA as to avoid any complications of their offspring even when the chances are 3:1 for an AS child. I would love to know how easy it is to care for three SS genorype children sir. Is it worth the stress? Would you make your choices differently if you had to start all over again? I’m currently in a dilemma of ending a relationship due to genotype related issues. These genotypes medical implications require worldwide human research; especially on historical trends in violence, technology, sporting skills, etc.